I WON ~ I WON !!!!! MAY YOU ALL HAVE A "MERRY CHRISTMAS"!!!! The last two weekends we have had snow storms blow in our area. We have received anywhere from 3-5" of snow along with bitter cold temperatures. We are having January and February weather in the month of December. The weather forecast is predicting another snow storm on Monday and Tuesday but not committing to how much snow. The word is more snow on Christmas Eve and Christmas Day. I believe winter has arrived before December 21st which is the first day of winter. December 21st is also the beginning of gaining a minute each day of daylight. The last few days have been ole dark gray skies here in Indiana. If we are lucky the temperature has gotten up to 23 degrees. One morning the temperature was -4 below and that was a very cold morning. I must say...the snow makes for a beautiful Christmas season and gives many the spirit of Christmas! Thanksgiving Day is a day for family and all our blessings. I think each year I count my blessings more and more. I know I am blessed with so much in my life. As Thanksgiving arrives so do all my memories of family, many that have passed. As I am preparing my Thanksgiving meal I can't help think of my Grandmother Mabel Pickett. I was so blessed to grow up having her as my "Grandma Pickett". My Grandma Pickett was a kind hearted lady who grew up in Glasgow, Kentucky as a child, met my Grandfather at an early age, married and to Indiana they went. She was mother to six children, thirteen grandchildren and several great grandchildren. This leads me to cooking and a great cook she was. When I became a mother and decided to fix my first Thanksgiving meal who else but Grandma Pickett did I turn to. This was over 30yrs. ago and I still have all my notes of recipes just how Grandma told me to cook. I still go to my recipe box for many of her recipes, starting with her noodle recipe. Her notes are so interesting on every detail of how to do this or that. I go from making Grandma's noodles to her Oyster Dressing recipe. I must say...Thanksgiving isn't Thanksgiving without "Grandma's" Oyster Dressing. I have many of her recipes that I go back to each year. But what I really go back to each year is the memories of Grandma Pickett and how she had all of us pile into her home to enjoy her delicious Thanksgiving meal!!! The memories of her preparing her holiday meals for days ahead of that special day. Grandma Pickett's blessing each year was to have her family. My blessing is having all the wonderful memories of my Grandma Pickett and the recipes I treasure with my family each year. Another Thanksgiving blessing I am going to share with each of you... 33yrs. ago I gave birth to my second child Carson on Thanksgiving Day. What a true blessing!!! So each year we celebrate not only Thanksgiving but Carson's birthday. Every seven years his birthday falls on Thanksgiving Day and this next year his birthday will once again be on Thanksgiving Day. I am so blessed to have my family and with each of them looking forward to my holiday meal and time to spend together on Thanksgiving Day!! Last blessing...Each of you who take a few minutes out of your day to read my blog. Thank you!! As I end this Thanksgiving posting, I hope each of you had a Blessed Thanksgiving Day!! And with many memories of family. WISHING ALL A HAPPY THANKSGIVING!!!!!!!!! Just in time for Halloween, please meet Ms. Halloween Witch!!! Ms. Halloween Witch was stitched on 14ct. Country Mocha Aida Cloth. I picked this cloth as I like the aged antique color. I would rather have had an 18ct. but it wasn't available. My cloth was purchased from Needle Fever Shop, Indianapolis, Indiana. The pattern came from a Leisure Arts book titled "Holidays Remembered". My floss was DMC and the frame was purchased from Hobby Lobby. I have enjoyed all the cross stitch patterns I have stitched from the Leisure Arts Books. I must say the patterns offer a challenge for the stitcher. The patterns keep you on your toes paying close attention as many colors are so alike that it can become confusing. The patterns are very easy to read and in color. I have purchased many Leisure Arts Books on Ebay and would recommend these books. Wishing a safe and HAPPY HALLOWEEN!!! I will soon be finished stitching my HALLOWEEN WITCH. Then comes framing and I am hoping to have this ready to show off by Halloween. The old witch is looking good!! Be sure to stop at the "members gallery" showing many beautiful homes. HALLOWEEN WITCH will be visiting you! Indiana's August 2010 was like no other August I can remember. Hot hot hot!!! Very hot and dry weather. No rain! Our grass is brown instead of pretty green. The farmer's corn crops are dry and ready to be picked. There is nothing better than an Indiana acidy tomato and I can't say I have had one this summer. There is one thing in my town that has loved this hot hot weather. At the edge of town by a shopping center strip is a retention pond with a water spout and many many water lillies. Oh are these Lotus Water Lillies ever showing off! Each day there has been many people stopping by taking pictures. This is a site like no other. My neighbor who is over the flowers and grounds of the Eli Lilly Center and Indianapolis Art Museum told me this is a "spectacular" view. He tells me the Lotus Water Lillies are way above the ordinary water lilly. We are so lucky because the Lotus Water Lilly grows mostly in tropical country, not Indiana. It is actually from the Indian cultural. These beautiful Lotus Water Lillies grow 4-5 feet, the pink to yellow cream colored flower is 10-12 inches and the leaves are 19-20 inches wide. Very large leaves! They also have seed pods and as they dry and harden they rattle. Again, the Indian cultural cut these pods and use them for art work. The roots are edible in different countries. There are many species of Lotus Water Lillies but the name of this Lotus Water Lilly is Green Maiden Water Lilly. Are you wondering how these Lotus Water Lillies come to be in this retention pond? I sure did. Well, again my neighbor man knew that answer too. He said a lady who was in the U.S. Water Garden Society decided years ago to plant a few seeds. I bet this lady is so shocked to see how many water lillies have grown this summer. Once again, these Lotus Water Lillies have loved our "tropical" summer weather and the day I took pictures they were really showing themselves for me and many other takers. I must say they have been the most "spectacular" flower showing this summer. So, I want to share with each of you this "spectacular" view. I hope each of you enjoy my pictures of these Lotus Water Lillies! Just to mention...I am still stitching my Halloween Witch. Until We Meet Again...Happy Stitching!! I just received in the mail the first issue of "A PRIMITIVE PLACE" magazine. It is the Fall 2010 issue. The very first issue too! If anyone loves the primitive/colonial decorating look...then this is a must have!! A PRIMITIVE PLACE magazine shows off homes, how to decorate, crafts and recipes. Anyone wanting to order this magazine ? I also loved how the magazine arrived in a plastic covering with no rips or tears from postal machines. What a great way to receive a magazine! So well protected. Now I can't wait to have the time today to sit down and browse through all the homes and recipes being shown off. Furthermore...can't wait for the next issue to arrive. It will be for the holiday season and just in time for Christmas decorating. Be sure and vist "A Primitive Place" blog. This blog is for sure the best blog for primitive, colonial lovers. There is a lot offered so be sure not to miss out...take a look. Don't miss the "members gallery" showing all the beautiful homes inside and out. It is a must !! The ole HALLOWEEN WITCH is coming right along. To this date I have stitched the snow white owl, the witches face, hat and scarf along with some hair. I feel pretty good with my stitching so far. Everything seems to be moving quickly. I also have a few of the stars finished too. I always do my backstitching last but with this pattern it was driving me crazy looking at the owl and witches face. Looking at these areas made me feel like I was sort of lost or no direction of where I was. Guess you could say, everything seemed to be running together. Don't know if this makes any sense but again was driving me crazy. 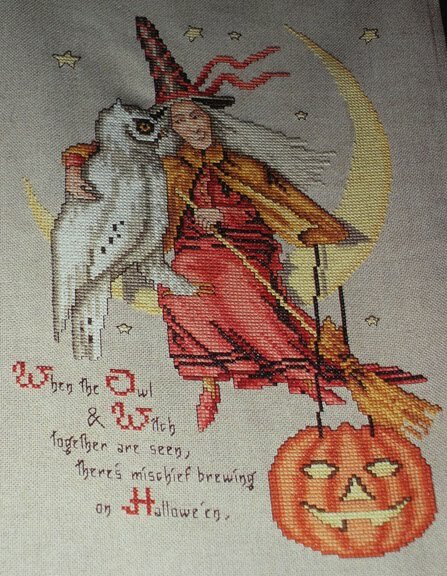 So, yes...I did the backstitching of the owl's beak and around the witches hair. Then I backstitched the witches face and stitched in all details. I must say...I feel so much better!! I now feel I can move on knowing where the owl & witches face started and stopped. Maybe this is called "finding my way". Next I will stitch the witches hand around the white owl and then on to her long stringy white hair. I have a picture of the Halloween Witch in my previous post, so scroll on down and you can see this neat pattern. So far this Halloween Witch pattern has been a real joy to cross stitch. Halloween and Autumn is my most favorite season of the year. I love all the colors that go along with Autumn. The Halloween colors just catch my eye. I have a love for all vintage Halloween decorating. Perhaps this says my age or the time period I grew up. Whatever it might be I will take vintage decorating anyday over all the plastic decorating we have today. I have a nice collection of witches!! Witches are my favorite because they each have their own character. As an elementary school student we had our Halloween party and all the Moms brought in cupcakes, cookies and fudge. All of us got to dress up in our Halloween costumes and the entire school had a Halloween Parade walking the city streets as many watched. This was always a highlight of school and Halloween. Trick or Treating was simple fun! We didn't have the plastic pumpkins to put our candy or apple treats in, we just had ole paper grocery sacks. Our costumes came in a box that I can still recognize the odor as if it were now. In that box were your costume and false face. Halloween fun also was innocent throwing corn on porches, soaping windows and carving pumpkins. I remember as a child walking to the local feed store and buying 25 cents worth of cracked corn for throwing. I would always get a good scolding from the owner. Oh yes, the older kids might try and smash a pumpkin or two just for fun. My parent's allowed me to have a Halloween party and we all bobbed for apples. This was Halloween for me as a child growing up in a small town. So, I believe everyone reading this blog can see why I love Halloween. I also have a love to cross stitch Halloween patterns. I have shared in the past my Leisure Arts Books and today I want to show off what I am stitching. Yes...it is a Halloween Witch. When I ran across this Leisure Arts Book I just had to have it. The witch sold me immediately! 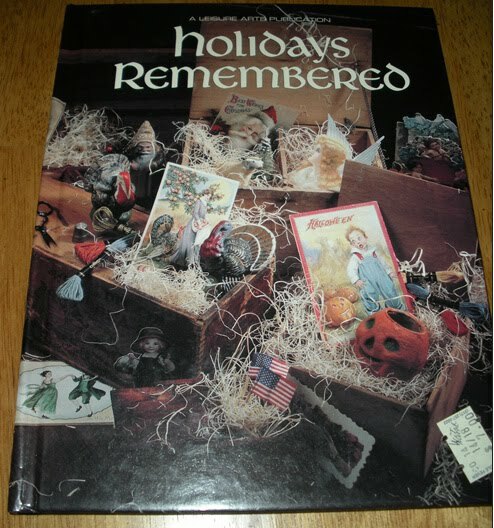 My pattern is from Leisure Arts Book " HOLIDAYS REMEMBERED",this is Book Five from the Christmas Remembered Series. The pattern is "HALLOWEEN". I am stitching on Antique Mocha Fabric, 14Ct Aida. This is a pattern that makes you not want to put it down. As I see the colors coming into play it becomes so addictive!! I have been thinking what it will look like framed. Today, I am showing the picture out of the book. When I finish this Halloween Witch you all will get to see her hanging on the moon. I won the $60 CSN Store gift certificate from PLUM STREET SAMPLERS, PAULETTE STEWART. This last week PLUM STREET SAMPLERS was doing a give-away. Myself, I have never heard of the CSN Store online shopping. Also, I have never won anything in my life. Since I read Paulette Stewart's blog each day and seen her give-away I thought why not. I never think about winning because it hasn't ever happened to me, always someone else. How many times I have entered a comment on Pioneer Woman and see all those lucky people winning. As the saying goes...if you don't enter, you don't have a chance at winning. So, last night when I received my email from Paulette I was so in disbelief. Not me!! Oh yes me!!! It took me a few times to read and reread that email trying to make sense of it. Then I go to PLUM STREET SAMPLERS blog only to find the video with Sophie and that chalk board and it had my name. Yes, it still took a second or so to soak in. Then came my email from CSN Store with my gift certificate information and code numbers...it really is true! Today, I have been browsing the CSN Store online and thinking how can I spend my $60 only to find so many items. I have until the end of the year to decide, so I think I have a few days to make up my mind. So, everyone when you see a give-away...go for it! Take a chance, afterall...you might just be the lucky winner. I was so excited when I got the news that I had to email my sons and their wives. I also went to bed thinking to myself...oh my gosh!!! Can't wait to tell my husband in the morning. His thoughts are...pretty neat!!! So, last things...a big THANK YOU to PAULETTE STEWART/PLUM STREET SAMPLERS and CSN STORES online shopping!!!!! Make sure you go to PLUM STREET SAMPLERS and check it out. Paulette has an awesome blog and family. By the way, check out her recipe blog too, FOUR SEASONS CAFE. 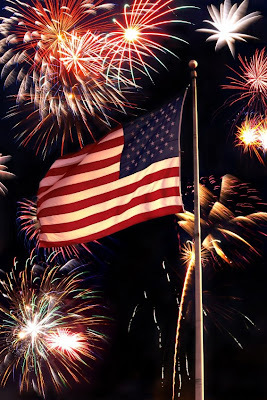 WISHING EVERYONE A SAFE AND HAPPY 4TH JULY!!! Today I want to share with you a pattern cross stitched/finished by my daughter-in-law Melissa. Melissa purchased this pattern in Michael's and it is a Dimensions Kit. A Gold Collection Mini Petite titled "UGLY DUCKLING". She stitched it on 18Ct Aida Ivory and DMC Floss. The frame and mat was purchased from Michael's. The mat was a special cut ordered through Michael's. It is always an enjoyment to see Melissa's cross stitching, she is a fast stitcher and does most of her own framing. She has a wonderful collection of Winnie the Pooh in which she stitched and framed herself. One of these days I will get pictures of her collection. At this time she is cross stitching another Dimensions Kit with birds. This is a larger pattern and will be beautiful when finished. Can't wait to see it finished ! Wishing all a HAPPY FATHER'S DAY !! It is a beautiful, hot day in good ole Indiana. Hoping all families enjoy this wonderful day. My family celebrated "Father's Day" with my husband, father-in-law and my oldest son Craig, all as father's at a great restaurant The Iron Skillet in Indianapolis. We also celebrated my mother-in-law's 82nd. birthday. What a nice dinner and evening ! Today, my husband Scott & I are going to take a drive & enjoy the day. Arriving is Santa in May. Santa is ready for Memorial Day with his American Flag! It looks as if Santa is walking with his walking stick, suppose he is in a Memorial Day Parade ? If he were in a Memorial Day Parade in Indiana...he would be pretty hot in his blue coat. Indiana temperatures are in the high 80's to low 90's and of course it wouldn't be Indiana without humidity. So, ole Santa would be sweating on a day like today. This pattern I got out of an Leisure Arts Book, Book 8, Christmas Remembered Series. Title of book is Down Santa Claus Lane. I stitched Santa on Aida 18ct Cloth, Antique White and DMC Floss. He was pretty simple to stitch and now I will be finishing him with an American Flag fabric as an ornament. I do have room on my cloth to cross stitch one more ornament. I have chosen a doll pattern that says Merry Christmas. I have been busy cross stitching an old pattern I found in a Leisure Arts book. It is from the Christmas Remembered Series, Book Eight. The title of the book is Down Santa Claus Lane. The pattern is "An All American Celebration". The Santa is from the Olde World collection in his blue coat. I loved this pattern the minute I laid eyes on it. Santa stood out so proud carrying the American Flag. It is a Christmas ornament. Soon to be finished, just got an arm to stitch and the backstitching. As soon as I am finished stitching I will post a picture. In the meantime I hope everyone is enjoying "spring" and beautiful weather. Thinking of you Mom on this Mother's Day. My Mother was everything to me. I was known as her shadow as a young girl. Today, I hold my memories close to my heart. 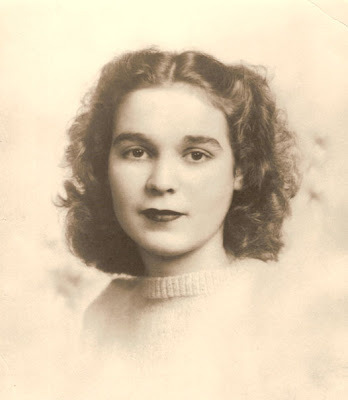 Another favorite picture of my Mother as a young girl. Here is wishing all Mothers...HAPPY MOTHER'S DAY !!!! Today I want to share with all of you another favorite picture of mine. If I had to give this picture a title, not sure what it would be. Just a few thoughts that come to mind. I actually know each of these kids in this picture. There are two still living today. The child in the middle, who looks like a boy is in her 90's in a nursing home. The baby is 84 yrs. old and he is my father-in-law. I suppose you might be wondering why I like this picture. I think it says a lot. They all were so poor but so close as a family. I look at their shoes and socks, I believe they were called leggings back then. Their shoes seems so dusty looking and they all have dresses on, even the baby has a dress. There are chickens behind them pecking around for a bite to eat, looks pretty dry to me. What I really love about this picture is the last child with her hat. I wish I knew what was so funny to her. When I married my husband I got to know each of these children and I have to say each of them were special in their own way. I have to go back to the girl with the hat, Geneva was her name. I felt I knew her a little more because her son has always been like a brother to my husband. 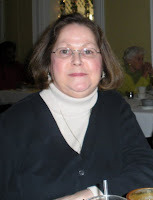 Geneva was an elementary school teacher until she retired. To this day we all love hearing many stories about each of these children. The girls as they were adults had a singing group. It is funny to hear how they would argue among each other when one was out of tune. There was another child born being a boy. He is still living. So in this family there are three children living. I can only imagine what this picture would be like in color. I hope you all have enjoyed this picture. My next posting will be about Cross Stitching. What I am stitching and pictures. Today I want to share the last "March Birthday". As in my previous posting about "March Birthdays" I shared about my family having many birthdays in the month of March. Today, is my Mother's Birthday ! If my Mother were alive she would be 81 yrs. old. My Mother never wanted to celebrate her "Birthday" as she always said...just another day. I remember her 60th Birthday, my Dad surprised her with a Birthday party. Needless to say my Mother wasn't very happy at first but as the evening went on she settled into the thinking...okay, it is my Birthday ! For years to come we always heard...I don't know why your Dad had to do that. My Mother never wanted to be recognized or much less be the focus of attention. This leads me on to "pictures" ! Never did she want her picture to be taken. When she seen the camera coming she would exit the room or turn her head. Don't ask me why. So, to have pictures of my Mother is quite out of the ordinary. As the years went on we all did get pictures of her. However, as a young girl the family of sisters did have pictures. So today I am sharing with all of you my favorite picture of my Mother as a young girl. I have always loved this picture of my Mother because of her big eyes and how defined her lips are with lipstick. My Mother's hair was Auburn and the sweater was yellow. I think she was beautiful in this picture. So once again...the last "March Birthday". Blessings to my Mother and Happy 81st Birthday !! March is a busy month full of " March Birthdays ". I have always loved the month of March for many reasons. The first reason being "spring" is on the way. However, an Indiana March can change very fast. Here in Indiana we have had a very nice March with a few days into the 60 degrees. Today is another warm day with beautiful sunshine. When I speak of Indiana weather...the forecast for Sunday evening is snow. There is one thing about a spring snow...it normally has no accumulation and leaves the same day. I must say we have flowers blooming and the grass is turning green. So once again spring is on the way. Speaking of spring...March 20th is the first day of spring. March 20th has always been a special day for me. This is my "Birthday" ! I always remember as a child how I couldn't wait for my "birthday". On my mother's side of the family I was the only granddaughter. I don't know who enjoyed my birthday more, myself or my Grandpa Thomas. Grandpa always made my birthday a very special day. I remember the year he got me a pogo stick...poor Grandma, I jumped all through her house. I am sure she was happy to see me go home. Jumping all the way out the door on that pogo stick. My love for my birthday wasn't so much about turning another year older but receiving greeting cards. I think to this day it is why I love sending greetings cards. Age has never bothered me because afterall, what can you do about it. Last week while in the hair salon I was ask how old I would be on my birthday. When I answered the room went silent and all eyes were on me. At that moment I truly felt my age. Ha ! I am not the only person having a birthday in March...the month starts out with my father-in-law being March 9th. My Aunt Anita on March 10th along with several cousins following. Then here I come along on the 20th. My son Craig will be 34 yrs.old on the 29th. My mother's birthday is the 30th. I also have to mention one last birthday. I have a wonderful neighbor lady who is young at heart. She drives, lives alone, does her own shopping & loves wishing all she knows " Happy Birthday". Her birthday is on the 24th of March. She shares her birthday with her daughter on the same day. Wishing my neighbor lady Aletha Phillippi a very happy 92nd. Birthday !!! Would you believe I just had delivered a bouquet of flowers from her ? That is Aletha !!! March Birthdays ! Here is to you...HAPPY BIRTHDAY TO ALL !!!! Who was ole Lizzie ? Lizzie was well known in my hometown. She was a woman of her time. Lizzie always wore a dress, nylon stockings and some days an apron. On a very hot Indiana day Lizzie would roll her nylon stockings down to her ankles, becoming anklets. She wasn't into Keds tennis shoes that were popular in those days, she had hard leather shoes. 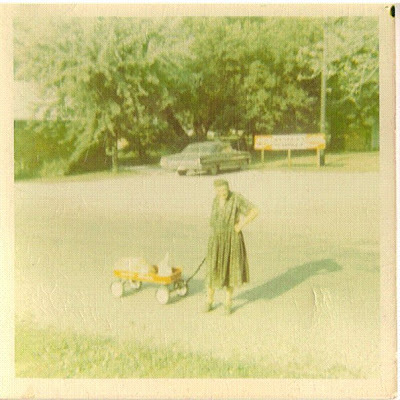 Walking many miles a day with her little red wagon and those hard leather shoes. Lizzie worked each day around town pulling her little red wagon looking for food. Many grocery stores knew Lizzie and would give her handouts. Her day started early until late in the day. She was a hard worker and was ahead of times for women working outside of the home. It never mattered what the weather was, hot, cold, rain or snow, everyone seen her all around town. I look back at my memories of Lizzie and realize she was the "towns sweetheart". Most town folks knew Lizzie had her own "sweetheart" and his name was Pete. It was commonplace to see Lizzie and Pete walking to town. As they both worked for their finds each day. Lizzie with her red wagon and Pete with his big cart. One day as Lizzie was headed to town she posed for her picture. I was just a young child learning a camera and ask to take her picture, she was so thrilled. Lizzie and Pete both have passed away but there isn't one person from my hometown that doesn't have a Lizzie & Pete story. When Lizzie's name is mentioned...it brings a smile. After all these years I truly feel ole Lizzie was a real "sweetheart" !! I hope everyone has enjoyed this Valentine's Day ! Snow storm is on it's way !! This only makes our second snow storm within 4 days. Last Friday we received over 5 inches of snow. Starting tonight through all day Tuesday we are to receive an additional 5-7 inches of snow. Then on Wednesday the wind is to whip the snow around and make matters worse. There are many of us who love snow storms, especially those who don't have to get out in the storm. Myself, I love being home looking out and watching the falling snow. I also love being home and thinking of what I can cook, I find on these cold snowy days it is comforting to be home with a hot home cooked meal. Comfort food ! I myself don't get out to build a snowman but I thought I would share with all of you the life of a snowman. Its okay if you're a little bottom heavy. Wearing white is always in style. Winter is the best of four seasons. The key to life is to be jolly, happy soul. We're all made up mostly water. Accessorize ! Accessorize ! Accessorize !! Don't get too much sun. It's embarassing when you can't look down and see your feet. Its fun to hang out in the front yard. There's no stopping you when you are on a roll. As the snow falls and the winds blow I hope to be cross stitching on my latest pattern. I am stitching BLACKBIRD DESIGNS from Joyeux Noel book pattern " MERRY CHRISTMAS". I am stitching a little slow but I will get there finishing this pattern to move on and put Christmas behind me until our next Christmas season. The ole CROSS STITCH WOMAN is soooooo slow !! Santa Claus has arrived !! Yes, Santa Claus in his gilded cart is here, finished & framed. I finished backstitching Santa about ten days ago and was trying to figure which frame was right for him. I had a red frame but I kept thinking the antique looking frame went better with the color of cloth. I don't know the name of the cloth, only that it is 14ct and I liked the antique look. Santa Claus In Gilded Cart is from The Schiffer Collection by designer Donna Gallagher. The title is " FATHER CHRISTMAS III ". I bought this pattern booklet on Ebay and it is a retired booklet. I have a love for folkart, antique and old world Santa's. I feel this pattern fit into the antique look of Santa's. I must say, I enjoyed stitching this pattern but the backstitching seemed endless. The copyright was 1990 and I can sure say today's patterns are much easier to follow. Overall, I am happy I stitched ole Santa Claus in gilded cart as he makes a nice addition to my Christmas collection. I am ready to move on to a newer project and thinking of doing one last Christmas pattern by BLACKBIRD DESIGNS. "MERRY CHRISTMAS" from the JOYEUX NOEL Booklet. I will be making a change on my cross stitch of this pattern. I will replace the snowflakes with the holly/berries. I feel this will give a little more color to pattern. We still have snow and cold weather. We are to have a warm up this week, in the 30's but still flurries. It has been so cold out that you just want to stay home. It has been nice to stay home and do my backstitching in the evenings. I am hoping to be finished soon. I never realized how much backstitching this pattern has. It now has me looking at other patterns and thinking to myself... how much backstitching does this pattern might have. Ha! Looking each pattern over very closely. I really want to finish this pattern of Santa and his gilded cart so I can move on to a few ornaments. When spring arrives, so does my seasonal spirit getting with the new season. I normally don't want to be cross stitching Christmas when it is Easter. That is just me and that seasonal spirit again. Have any of you noticed BLACKBIRD DESIGNS has announced the next and last two stocking booklets. Those being November and December. Very pretty !! The gals are asking for suggestions for upcoming patterns. Boy did I have a few suggestions. I suggested quick ornaments such as vintage Santas, snowmen and Christmas trees. I also suggested witches as I am a witch collector. I know they have done two Halloween booklets but there is always room for more. I would love to see finishing instructions. I don't know about anyone else but I love to see tutorials on finishing, they can be so educational. Any tutorial dealing with cross stitch I welcome. Better get back to my backstitching ! New Year has come & started with a blast of freezing weather and snow. It is in the teens tonight and was 2 degrees last night. We have another winter storm heading our way on Thursday. The weatherman won't give an estimate of how much snow we are to receive but says an accumulation. Of course the ole saying in Indiana is...just wait five minutes and the weather will change. So, we will wait and see ! New Years Day our family got together for an evening dinner at our home with the daughter-in-laws pitching in. It was a nice quiet dinner. Then arriving was the freezing weather. Normally on New Years Day, I always take down our Christmas tree but this year it had to wait a couple more days. So, today... down came the Christmas tree and all the decorations. Funny how the house looks a little bare without all the bright red colors. I was told once that people feel depressed after Christmas and all the color "red" is gone in a home. The color "red" brightens a home and feelings. Today, I feel like I have a new beginning with the Christmas decorations down, put away and now I can get back to some normalcy in my life. With that said, comes... time for cross stitch ! I have started back cross stitching on my Antique Santa In Gilded Cart. I am going crazy doing all the backstitching. I do have plans of finishing Santa before the month ends. I am looking forward to starting a new cross stitch pattern. I had another Christmas pattern from Blackbird Designs picked out but thinking maybe doing some quick ornaments. In todays mail I received a package of very old CROSS STITCH MAGAZINES. I am talking over 20 years old. This might sound odd, but I feel they are better magazines than some of todays on the market. I have been looking at some ornaments that look inviting and perhaps quick to do. So, I am looking ahead in this New Year of 2010 to doing some of my own coffee/tea dyeing cloth and hoping to stitch a few ornaments. I love the antique look. As I finish Santa & his cart I will be posting a picture. I had better get busy cross stitching !! Please check back soon for Santa's picture.